Home » 最新情報 » Naoto Kusakabe(19), the champion of Kata and Kumite at the SoKyokushin All Japan tournament held in April 2018, his interview on Shizuoka newspaper. 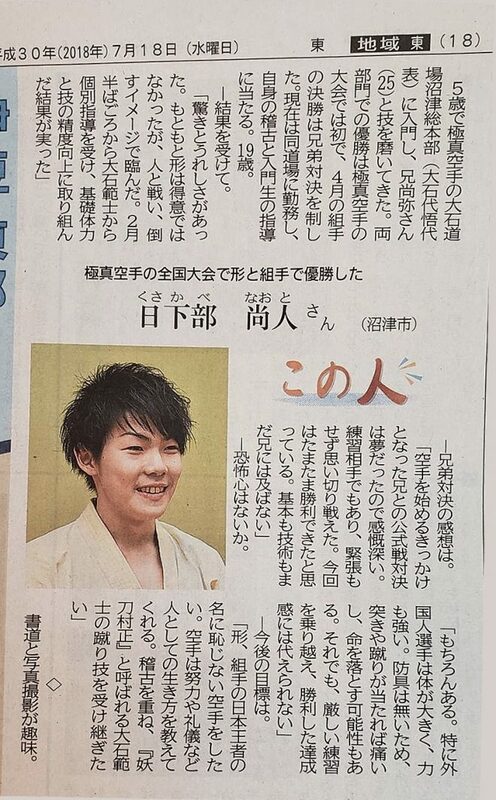 Naoto Kusakabe(19), the champion of Kata and Kumite at the SoKyokushin All Japan tournament held in April 2018, his interview on Shizuoka newspaper. Naoto won the 1st prize of both Kata and Kumite at the tournament. At the Kumite final, he fought against his brother. —I’m happy and bit surprised cause I’m not good at Kata. But it worked this time I did my performance with this image of ‘knock-down the oponent’. Since feburuary, I’ve had private keiko with Hanshi Oishi. And I spent much more time than I used to for building up basic physical strength and the improvement of skills. It all worked. What do you feel about the Kumite final? —It was my dream-come-true, fight against Naoya and win at the official tournament.We’ve been together from the first day of training. I fought with all my best without being nervous.I feel I was lucky this time. Naoya is better than me with his skills and kihon. Do you feel fear when you fight? —Sure,I do. The fighters abroad are usually bigger and their power is stronger. To fight without protector includes the possibility losing life. But the accomplishment of victory after all those hard training is wonderful and worth everything. Do you have any plan or goal? —I’m going to do my utmost to not disgrace the name of champion. Karate taught me the coutesy, the virtue of effort and the things necessary for life. My goal is to inherit the Hanshi Oishi’s kick called “妖刀村正(Yoto Muramasa) someday after a lot of practice.